This afternoon we were treated (via USA Today) to additional details surrounding the vocal cast for the upcoming Pixar film, Inside Out. The director of the film, Pete Docter, revealed who Riley and her parents would be voiced by, but also included a few more notes regarding the story elements as well. 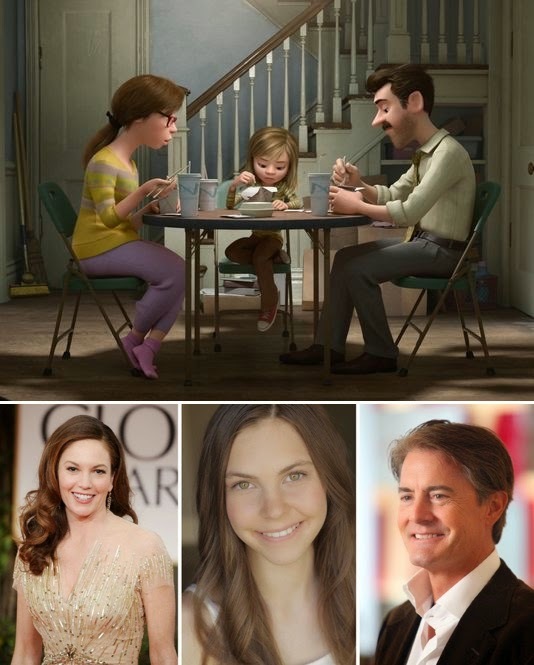 Riley's Mother will be voiced by Diane Lane, her Father will be voiced by Kyle MacLachlan and Riley, the 11-year old girl who is the setting for the film's emotions will be voiced by Kaitlyn Dias. Below we have summarized some of the additional details surrounding the parents from the USA Today post - read the entire article here. "These guys are the pillars on both sides," says Docter. "They are pivotal parts, knowing how joyful this kid Riley used to be and the young woman she's changing into." So while Riley's mind is full of out-there comedic characters (particularly Joy), the parents are more "rooted in reality and very truthful," says Docter. "Both of those actors do that very well." Inside Out takes viewers inside the mind of all three human characters. Dad's emotions have Headquarters like a Norad missile defense site and have mustaches. Very male. Meanwhile, Mom's Headquarters features emotions wearing her red glasses and who engage in civil discussion à la The View. "There's our world which we're conscientious of and looking at. So we're driving, eating dinner, whatever. And inside our head there's this whole rich internal dialogue and world no one else knows about," says Docter. "This film gets you inside each character's heads." Most notably from the article, USA Today also mentions that this Wednesday (December 10, 2014) will also be the release date for another trailer for Inside Out. If early indications we've been hearing are true, this trailer should be 2:08 in length. Previously, we have seen a teaser trailer as well as the series of posters and videos focused on the emotions, but it will be fantastic to see another trailer featuring Riley and the emotions in just a few days. Thanks to our friends, Dan "the Pixar Fan" & Seth I. for the heads up on the article. Dan first mentioned the news in the Inside Out section of the Pixar Post Forum and we welcome everyone to chat about the news in the comments below or leave a comment on the forum. 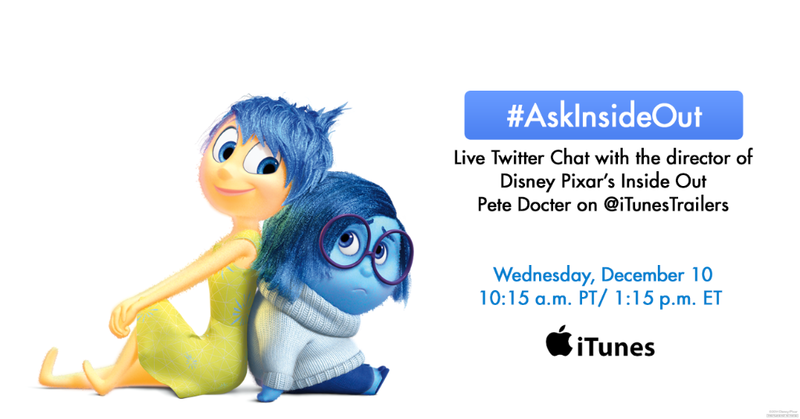 UPDATED December 9 7:00 PM - Tomorrow at 10:15 AM PST / 1:15 PM EST, Inside Out director, Pete Docter will be fielding your questions during a Live Twitter chat. All you have to do is ask your question using #AskInsideOut and he may answer your question. So, what will you ask Pete?